Waste industry should review contingency plans in case of disruption should the UK leaves the EU without a deal. The government is reminding companies which export waste from the UK to review their contingency plans in case of disruption at ports, should the UK leave the European Union without a deal. Leaving the EU with a deal remains the government’s top priority. This has not changed. However, a responsible government must plan for every eventuality, including a no deal scenario. With or without a deal, all existing consents which authorise the export of hazardous waste, known as ‘notified waste’, to any EU country will remain valid when we leave the EU. 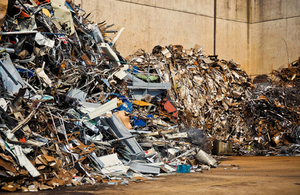 Companies that export waste from the UK will see no change in the processes that govern the export of ‘non-notified waste’ (‘green-list’ wastes) to the EU. However, in the event of no deal, changes to border controls may impact on some waste exports. Disruptions at container ports are not expected, but there may be some delays at locations which operate ‘roll-on, roll-off’ systems. Waste importers and exporters should make a plan to minimise any impacts on their business. In particular, a reasonable worst case scenario is one in which flow through the short Channel crossings (both imports and exports) could be reduced significantly for several months. Our landmark Resources and Waste Strategy makes clear that we are committed to dealing with more of our waste in the UK and increasing recycling. But in the short term, we have taken important action to ensure any disruption caused by a no-deal Brexit can be minimised. This government has been absolutely clear on our commitment to deliver a Brexit deal negotiated with the EU. But the government is preparing for any eventuality and we need our businesses to do the same. If you or your business collects, transports or stores waste that is due to be exported to the EU, your existing permit or licence still applies and you are expected to continue to meet its conditions. If you do change your export route, you will also need to change your export notification. This must be agreed by the UK and overseas competent authority. In England, you can contact the Environment Agency for advice, or contact the equivalent competent authority if you are in Scotland, Wales or Northern Ireland. If you have to keep additional waste on your site for longer than expected, you will need to consider any resulting environmental risks and take steps to keep these properly controlled. Your contingency plans need to be compatible with the requirements on your permit. In England, if you are unable to make adequate contingency plans you should contact the Environment Agency for advice. Anyone who suspects criminality in the waste industry in England should contact the Environment Agency on 0800 80 70 60 or anonymously via Crimestoppers on 0800 555 111. ‘Notified wastes’ are hazardous wastes, mixed municipal wastes and the residues from incineration of mixed municipal waste sent for recovery and any wastes sent for disposal. ‘Non-notified’ or ‘green-list’ wastes are non-hazardous wastes destined for recovery. 25 March 2019 First published.